We are open two days a week for drop-in play. It’s free-flow, it’s creative, it’s often messy! PLEASE NOTE: We are closed on bank holidays. Please check our facebook page for updates. Every day is different at Doorstep. 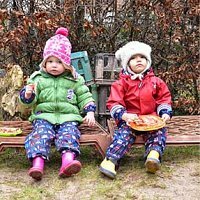 There are regular features from dressing up to kitchen role-play to story corner to all weather outdoor fun. Our wonderful team of play leaders, assistants and volunteers dream up a changing line-up of creative craft and play activities. All sorts of play opportunities are available from opening time onwards. We have a tidy up before lunch is served from 12 (check out our Doorstep Kitchen page to find out more about that) but you can keep playing outside or inside if you don’t want to have lunch here. Our drop-in play sessions are a great way to spend time with the children you look after. There's no upper age limit but most of our young visitors are 0-5. Our staff and volunteers are here for chat, advice, support and ideas, and you’ll meet lots of other local parents and carers. If you find it hard to do messy play at home, come along and let us inspire you! There is no entrance fee for Doorstep. We simply encourage those who can to give us a donation of £2/person in the donation jars near our kitchen counter (or more if you can). This helps us stay open and develop all the fun things we do! Keep an eye on this website, or follow us on social media to make sure you hear about any changes in our opening hours.